I Was The Voice of Democracy is an hour-long, solo performance that recalls the true story of a 17 year old kid who is briefly thrust into a peculiar kind of fame when a patriotic speech he writes on a whim ends up winning a national contest. This multimedia storywork event offers a mix of analysis and anecdote (both hilarious and heartbreaking) as Brian puzzles through the memories, mementos and artifacts that comprise the archive of his own teenage experience. By turns comedic and contemplative (and told in style that is equal parts David Sedaris and Spalding Gray), I Was The Voice of Democracy asks whether we ever really stop being the person we once were. I Was the Voice of Democracy received its world premiere presentation as part of SoloFest 2010 at Albuquerque’s The Filling Station (where it was selected as the Festival’s closing night “Encore Presentation”). Subsequently, I Was the Voice of Democracy was presented at New York’s Dixon Place, Taos’s Metta Theatre, Seattle’s Annex Theatre, at Albuquerque’s The Kosmos ArtSpace, at the University of California at Los Angeles, at the University of Kansas, and at the University of North Carolina (Chapel Hill). The show was also featured as part of the 2012 Revolutions International Theatre Festival (ABQ), the 2012 NoPassport Theatre Conference (Arizona), at Cornell’s 2012 Resoundingly Queer Conference (Ithaca) and as the Keynote Performance of the LGBTQ Pre-Conference of the 2011 annual meeting of the Association for Theatre in Higher Education. A radio version of the show premiered on KUNM’s Radio Theatre in June 2011 and has since been heard coast to coast on public radio stations in the United States and Canada via Public Radio Exchange. 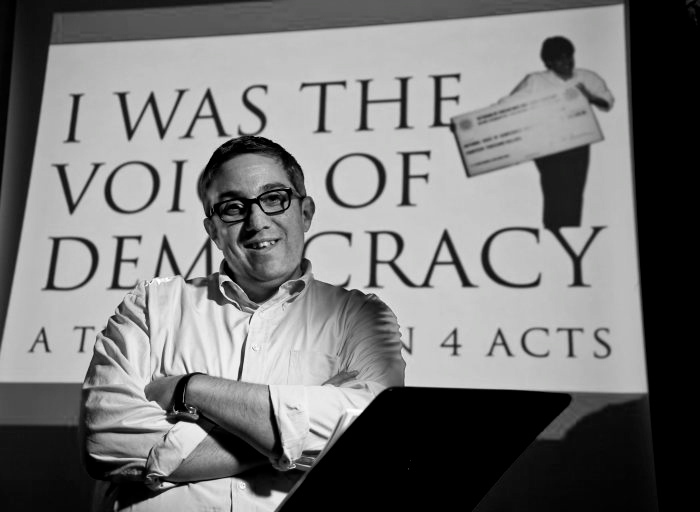 In 2013, I Was The Voice of Democracy was presented at the American University of Beirut (Lebanon) and at NYU-AbuDhabi.